We can’t leave our furry friends out when it comes to dressing up for Halloween. While costumed pooches may take center stage, don’t leave your purring pal naked in the background. While we may love transforming our feline’s identity, they will be less than thrilled. So when it comes to costuming cats, simpler is better. Here’s a list of a few ideas to for cat costumes made from things you may already have. Since most of us can’t have just one cat, here’s an idea for those with three. Dress that trio as three blind mice. All you’ll need is three pairs of dark glasses which can be made from black construction paper or old film negatives to give that reflective appearance. You can also make a rounded ear headband from paper and string. They already have the tails and whiskers; just make sure to keep them away from the carving knife! Just because it’s Halloween doesn’t mean there can’t be some other holiday inspiration. As evidenced by the Cadbury egg commercials, cats can make adorable Easter bunnies, especially Persians or Himalayans with their pug noses. Easter bunny ears and a tail can be made using paper and cotton balls or fabric glued to a pipe cleaner frame. 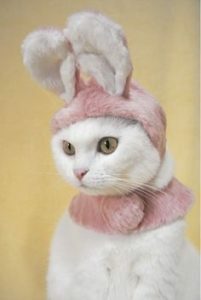 Then all you need is a cute bow to tie around kitty’s neck and he’ll be ready to hide those eggs. Kitties can also double as Saint Nick with the quick addition of a red hat trimmed in white. You can again make the hat from construction paper and cotton balls or from fabric, but chances are you can find something in your Christmas box. Also, as a side note, Santa hats make a great addition to pet photos with Santa come the holiday season. 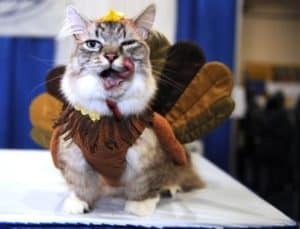 Another holiday dress up idea if you can teach your cat to gobble is a turkey. A few feathers attached to a belt and tied around the waist can pass as a turkey fan. Don’t hesitate to use multi colors for a little added touch. Your kitty could fill that role. You can skip the oversized shoes for this one. Instead a pointy hat and a colorful, fluffy collar will suffice. The hat can be made from paper or fabric. The collar can be made from fabric as well, but an easy substitute would be a hair scrunchie. Remember with this one, the brighter the colors and the patterns on the hat and collar, the better. Let your kitty entertain by ‘juggling’ some of his favorite ball toys. 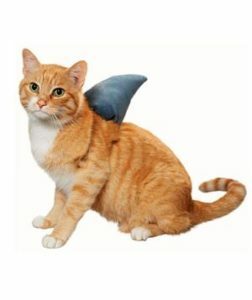 Since your cat will more than likely be lurking in the shadows anyway, especially if you’re having a Halloween gathering of some kind, you might as well put on the Jaws theme song and attach a shark fin to his back. The fin can be made of cardboard and string and we already know your kitty has the teeth! If your cat is the mischievous type, consider dressing him as a bank robber or bandit this Halloween. Tie a tiny handkerchief around his neck that he can slip over his nose right before he hands over the sack to put the money in. An added costume bonus would be if you could find GI Joe or other action figure gun belt to strap around his waist to make his threat more believable. 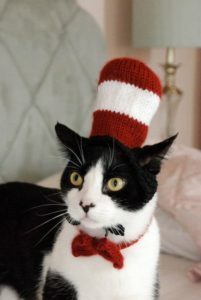 This Halloween you could dress your kitty as a beloved Dr. Seuss character, the playful Cat in the Hat. A red and white striped top hat and red bow tie complete this outfit. This hat can be easily made of paper or fabric. For those of you with a couple of dogs, the Cat in the Hat does his best work when accompanied by his helpers the twins Thing One and Thing Two. This can be a great family costume as kids can dress as Sally and her brother to complete the ensemble. Finally, one costume your cat might not object to, as much. PetPaint is an animal safe, non-toxic paint that easily washes out with soap and water after Halloween is over. PetPaint allows you to create whatever costume you like. You can paint tiger stripes, cheetah spots, paint your kitty pink to mimic Mr. Bigglesworth, or make him a billboard for any logos of your choosing. Bathing your feline may be the worst part of the whole procedure. If your cat refuses a water bath, you can try waterless shampoo or wet wipes to remove the paint after the festivities have concluded. Now this may not be something that you would normally have around the house, but perhaps it should be. This product could make easy cat costumes for years to come. Halloween can be a fun holiday for your cuddly cat as well. However, when making your kitty’s costume, it’s best not to use rubber bands to hold on hats and other items. Rubber bands can be too tight and constrict blood flow causing damage. They can also be eaten and cause an intestinal blockage if your kitty takes off his adornments. Also, it’s important to keep your cat’s feelings in mind. 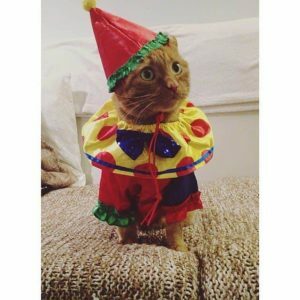 While these costumes are fun for you, some cats can become very upset and destructive when asked to perform for the holidays. 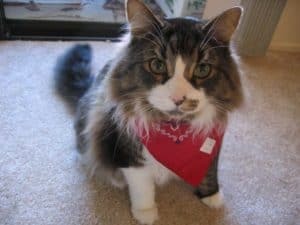 You don’t want to create a rift between your and your feline, or worse yet, get bitten or scratched when trying to slip them into their costumes. Halloween can be a terrific holiday to share with your furry family. The most important thing is to create a safe environment for you and your pet and to not share your treats with the kitty. Happy Halloween! 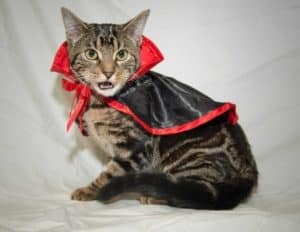 The post 8 Quick and Easy Cat Halloween Costumes (So they don’t feel left out) appeared first on VetBabble.